When you’re just starting a ketogenic diet, it’s common to be daunted by the idea of finding easy keto meals to prepare. After all, you’ve just cut carbs out of your life almost entirely — how do you create a whole keto meal that’s satisfying, tasty, and simple enough to throw together on a busy day? Thankfully, eating keto isn’t quite as complicated as it first appears, and there are so many easy keto meals that can even be prepped ahead of time so you don’t have to stress when you see dinner time quickly approaching. So whether you’re a newbie just getting your feet wet or a seasoned keto veteran looking for fresh meal ideas, we’ve compiled this list of easy keto meals to give you quick and delicious ways to stay in ketosis and avoid falling into cravings. You’ll find keto foods that can be thrown into a crockpot or Instant Pot, along with make-ahead dinners that you can stash in your freezer til you’re ready to eat. Get ready for the best keto recipes you’ll want to try immediately! If you’re a “set it and forget it” type of cook, these super easy keto meals are for you. Just assemble your ingredients and toss into a crockpot or instant pot, and come back to a delicious meal that’s sure to please. Not only are these meatballs delicious and tender, but they only take 10 minutes to cook in your Instant Pot! With just a little bit of prep work to mix and roll the meatballs, you can have a hearty keto Italian meal in short order. Pair with shredded spaghetti squash or zoodles to round out your dinner. I’m going to let you in on a little secret — I love pho. If you’ve never tried this delicious traditional Vietnamese dish, you need to. And thankfully, we’ve found this low-carb option to add to our easy keto meals list. Since this recipe leaves out the rice noodles and adds in more beef and veggies, you’ll get all the unique flavors of pho minus the carbs. Sometimes you just want a creamy comfort dish to end your day. These Instant Pot smothered pork chops are the ultimate cure to this craving. Heavy whipping cream creates a savory gravy that pairs perfectly with some cauliflower mash. It’s versatile, it’s customizable, and it’s a go-to all year round: it’s chili, and it’s super easy to make it keto! Make this yummy keto chili in a crockpot or Instant Pot for a great weeknight meal. Don’t forget to add cheese and sour cream! Chicken Marsala is a popular dish, but it can be a little time-consuming to make it the traditional way. This makes our list of easy keto meals because it’s made in a crockpot — which means you can throw it together in the morning and come home from work to a fully-prepped chicken dinner. Pair with cauliflower mash or cauliflower rice. You know that feeling when you find a copycat recipe for one of your favorite restaurant dishes? Well, get ready to have that feeling. This is a keto version of Olive Garden’s famous Zuppa Toscana, so you can enjoy your favorite soup sans the carbs. Perfect for a date night in. Nothing beats Tex-Mex if you’re trying to brighten up a dull weekday meal — and these keto chicken enchilada bowls will do just that. All the spice and heartiness of enchiladas, but instead of tortillas you’ll have riced cauliflower to soak up the saucy goodness. Has there ever been a better marriage of flavors than that which exists between lemon and garlic? This lemon garlic chicken is super flavorful and tender, and since it’s made in an Instant Pot, it takes hardly any time to cook, making it one of the best easy keto meals to end your day with. Love Chinese takeout? Well, if you’re on a keto diet then you’re probably a little bummed to be missing out on fried rice and lo mein. Well, be bummed no more — here’s a low-carb chicken lo mein that you can make in your crockpot. Rather than traditional lo mein noodles, this recipes uses low-carb kelp noodles to cut your carb count back. This is the quintessence of easy keto meals — a classic roast infused with garlic. With hardly any prep time and a super savory outcome, this is a great dinner for when you have company or just need a filling meal. Pair this roast with cauliflower mash and green beans and you’ve got yourself a Sunday dinner! Head south of the border for dinner with these easy fajitas! Tasty shrimp and an assortment of peppers and onions make the perfect filling for either a low-carb tortilla or even a lettuce wrap. Or, make it a bowl with a bed of cauliflower rice. If you like the smoky, spicy taste of Asian five spice, you’ll love these slow cooker spare ribs. Rice vinegar adds tang and jalapeños add heat, for a fall-apart barbecue that’s unforgettable. You won’t even miss the carbs! If you like to plan your meals ahead of time, we’ve got the best keto recipes for you. These easy keto meals are quick to put together, and can be frozen and thawed and reheated later for convenience. This is an awesome recipe for when you have leftover ham in the house and are sick of resorting to ham sandwiches. With a big boost of veggie power from broccoli and lots of cheese, this creamy casserole is a hearty and easy weeknight meal. If you’re into lasagna, you’ll definitely dig this beef ricotta casserole. It has all the makings of a traditional lasagna, but minus the noodles — so you still get the rich ricotta and tomato taste. And, this is a casserole that’s easy to double-batch and stick one in the freezer for later. If there’s one food I truly miss on a keto diet, it’s pizza. But this “deconstructed” pizza casserole is a pretty darn good substitute. Packed full of beef, pepperoni, sauce and cheese, it’s essentially a meat pizza minus the crust to satisfy those cravings and still stick to your keto plan! There’s hardly anything as satisfying as homemade chicken and noodles — except possibly keto chicken and noodles. This low-carb spin on a classic casserole uses zucchini noodles in the place of the traditional egg noodles. So dig in and warm up without setting your body back. Beef — cheese — guacamole. Need we say more? Probably not, but we’ll expand on it anyway just to be safe. This is a super-fast, super-easy, super-delicious keto recipe that takes all your favorite taco flavors and combines them into a great make-ahead casserole. Who needs tortillas, anyways? Another oldie but goodie, now with a keto spin. 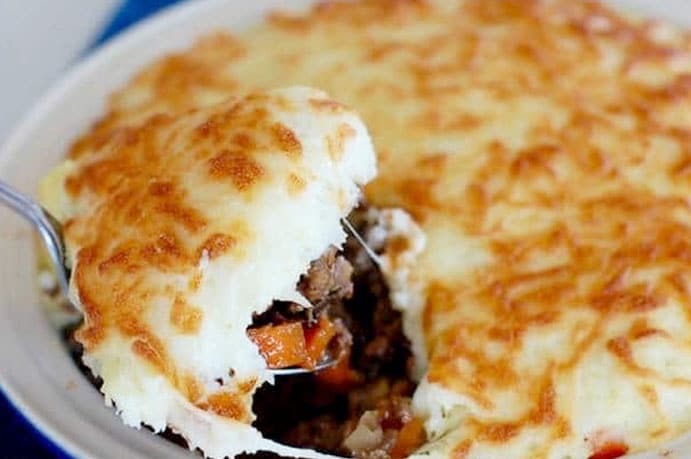 Shepherd’s pie has long been a hearty family meal, but the mashed potato topping is way too carb-heavy to be keto compatible. Instead, this recipe swaps out the spuds in favor of low-carb mashed cauliflower to keep you in line with those macros. In case you’re not familiar with tahini, it’s a Greek nut paste made from sesame seeds — similar to peanut butter, but not sweet. And its creamy, nutty taste combines perfectly with the tang of lemon and Greek herbs, for a unique Mediterranean flavor that will add some zest to your dinner plans. To make this meal ahead, just stick raw chicken breasts into a freezer bag with your marinade, mix it up, and put it back into the freezer until you’re ready to thaw and grill it. Occasionally you need to shake up your easy keto meals just a bit. This Brazilian chicken is the meal to turn to when you’re ready for something different. Loaded with turmeric, coriander, and other healthy spices, this flavorful chicken is complemented by a creamy coconut sauce and served over cauliflower rice. To make ahead, you can either freeze your raw marinated chicken, or freeze it after it’s cooked and just reheat and eat. Beef and broccoli is another delicious takeaway-inspired dish, but traditionally this meal can be carb-heavy due to added sugars. However, this keto version keeps the carbs low but doesn’t sacrifice flavor. You can eat as-is or serve it over cauliflower rice. Do you ever have one of those days where you forget to plan dinner? Well, thankfully we have some easy keto meals for those nights when you’re just too swamped to think too hard about what to make. Each of these contains only 5 ingredients or less, so even if you forgot to re-stock on groceries, you don’t have to resort to eating whatever’s left at the bottom of your pantry. This keto recipe may easily become your low-carb staple, because really — who doesn’t have chicken and salsa on hand at any given time? With only four ingredients and almost zero prep work, this keto meal is ideal for those nights where you just don’t have the mental energy to put into an elaborate meal. And it tastes like a million bucks, so there won’t be any complaints about it! Talk about easy keto meals — all you need for these delicious skewers is chicken, bacon and some peppers, and you’ve got yourself a light, low-carb meal that’s great for a summer evening. Or, if you’re entertaining, whip these up as a healthy appetizer to keep everyone satisfied until the main course. Let’s be real. Sometimes, the call of pizza is too strong to resist. In those moments, you don’t have to break your ketosis by ordering pizza — just mix up one of these super-fast 3-ingredient pizza crusts. You’ll see options for a coconut flour version as well as one with almond flour, so you can pick whichever one suits your palate. Then simply top with a low-carb sauce, cheese, and plenty of meat and veggies, and you can enjoy keto-friendly pizza in no time at all. Next up on our list of easy keto meals is this yummy soup — perfect for a chilly, drizzly day. Pair spicy sausage with fresh kale, mushrooms and garlic, and toss it all into a hearty broth. It’s surprisingly simple, but incredibly robust and satisfying. You can even customize it with your choice of vegetables, or add a keto bread to round out the meal. As far as easy keto meals go, this is one of the easiest. Just layers meats and cheese into a sweet pepper, bake it, and voila! You’re ready to eat. This is another meal that’s super easy to customize. Incorporate your choice of cheeses, experiment with different meats, go crazy! And you can make them in large batches to freeze individually — then you’ve got an easy lunch to grab when you’re running out the door. Five ingredients — five minutes of prep — and 30 minutes til it’s on the table and ready to eat. We call that a keto meal win! This delicious keto chicken is made with a savory vodka sauce and plenty of cheese for a savory, creamy dish that will please even the pickiest eater. Though it’s super-fast to make, it can easily be made ahead of time and frozen for a future dinner. We already had a lemon garlic chicken on our easy keto meals list…so here’s a different spin on those tangy flavors! Cod is a mild, white fish which makes it ideal for soaking up bold flavors. The lemon and garlic marinade is quick to put together and the perfect complement for flaky cod. Pair this dish with green beans or a fresh salad, and you’ve got a perfect summer meal. This meal looks way too elaborate to be only five ingredients — but it truly is this easy! This mozzarella and pesto chicken casserole is creamy and filling, and perfect for serving over zoodles or sautéed spinach. Add this to your list of easy keto meals and you’ll be serving it again and again. Literally one of the easiest of our easy keto meals, this delicious dinner is mostly chicken sausage and green beans, plus a few other ingredients for flavor. It may sound dull, but it’s far from it — this dinner will definitely become a go-to for your weeknight “throw something together” meal. They sound complicated, but they’re truly not. These five-ingredient pork chops are stuffed with spinach and cheese for a low-carb, protein-packed meal. Pair them with a salad or some sautéed zucchini and you’re good to go. It’s a common myth that eating keto is difficult or expensive, but the reality couldn’t be further from it! All you need in order to eat keto is a little mental preparation and the best keto recipes to save time and eat healthy — which is why we’ve compiled these easy keto meals. It can be difficult to keep your keto meals fresh — but there truly are innumerable ways to craft a meal that’s delicious, healthful, and keto-friendly! Whether these easy keto meals become your new meal plan or just a jumping-off point for developing your own low-carb tastiness, you’re sure to find something to suit every member of your family and every type of craving. So give one of these a try for your next keto dinner. As you progress in your keto diet, you’ll keep discovering new and fun ways to mix flavors while still keeping your meals low-carb. What’s your go-to keto dinner? Do you prep your keto meals, or make them on the spot? Leave us a comment and let us know how keto works for you!